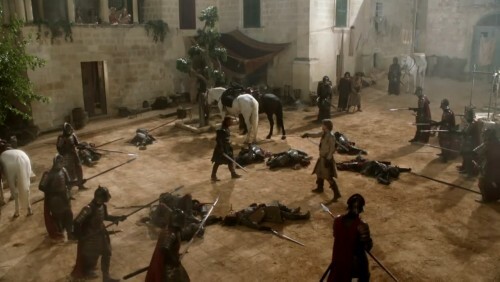 Ser Jaime pointing his sword at Ned. The way he moves in this scene suggests it’s possible that the Kingslayer took some injury to his leg, as he seems to be limping a bit. As previously noted, we can see Jorry Cassel, Ned’s captain of the guard and one of his most trusted men, lying dead on the ground.